“Times they are a changing“. This is the first e-letter of the year and already there is much to report and all the signs of a busy year ahead! First 100 days plan and beyond – The government has completed its promised first 100 day plan and implemented a broad scope of legislation, announced two inquiries (the abuse of children in state care, and mental health) and established two new agencies (independent Climate Change Commission and the Pike River Recovery Agency). But the government isn’t resting on its laurels.The direction of government post-100 day plan has now been announced and it includes taking up the challenge set by the OECD and IMF to measure beyond GDP. The plan is by Budget 2019, budget bids (for policies) will no longer be assessed exclusively against their impact on GDP. The impact on “natural, social, human and possibly cultural capital”, alongside GDP will be the new assessment formula. This is complex stuff. What we know so far is that Treasury will be at the centre of this work, and it involves the Living Standards Framework. If New Zealand pulls it off, we could be a trail blazer for other countries to follow. Child Poverty Reduction Bill – The much awaited and anticipated Child Poverty Reduction Bill (CPR Bill) had its first reading on 17 February 2018 and has been referred to the Social Services and Community Select Committee. Submissions are due 4 April 2018. There are 4 components to this Bill: i) 10 measure of child poverty (intermediate and long-term), ii) set of targets which are politically binding, iii) requirement to publicly report on progress against the targets, and iv) establishes a Child Wellbeing Strategy. Jonathan Boston’s opinion piece is worth a look. 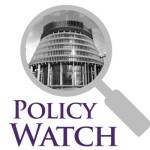 It summarises the history of child poverty legislation in the UK and compares it to the NZ context, explaining why the CPR Bill stands a better chance of succeeding if there is cross party and public support to reduce child poverty. NZCCSS supports the Bill in principle and will undertake consultation with members to inform its submission. Further comments on the Bill will included in the upcoming Kete Kupu newsletter. Inquiry into the historical abuse of state care – The Government has announced the establishment of an independent inquiry into historical abuse in state care and that the Inquiry will be a Royal Commission. Rt Hon Sir Anand Satyanand will Chair the Inquiry, and public consultation on the Terms of Reference will be undertaken. The scope of the inquiry is wider than anticipated but not sufficiently wide to capture all scenarios. The time period covered is the 50 years from 1950 to the end of 1999. The Inquiry will cover circumstances where the state directly ran institutions such as child welfare institutions, borstals or psychiatric hospitals, and where the government contracted services out to other institutions. The Department of Internal Affairs (DIA) is the lead agency and further details are available on DIA’s website. Changing the culture of Work and Income – Much has been written about the experience of people seeking help from Work and Income. The latest has come from Sam Orchard whose own experience of Work and Income was so demoralising he set about collecting other peoples’ experiences. The result is a powerful account of a lack of empathy shown to people in vulnerable situations. And although the stories mirror themes NZCCSS has heard over many years, the combination of direct quotes and artistry make this report a must read! The government’s desire to change the culture of Work and Income can not come soon enough. Sanctions for Christmas – NZCCSS Executive Officer Trevor McGlinchey’s recent blog is a reminder punitive sanctioning are still happening under our new government’s watch and this needs to change. From the quarter ending December 2016, to the same quarter in 2017, there was a 30% increase in sanctions (from 11,355 to 14,778). NZCCSS looks forward to proactively working with government to support changes flagged in the Labour party’s election manifesto. The Stocktake of New Zealand’s Housing prepared by experts Shambeel Eaqub, Prof Philippa Howden-Chapman & Alan Johnson shows the enormity of the challenge to improve housing for the poorest in this country. The scale of homelessness issue is shown by the number of people who emergency housing providers have to turn away because they have no available accommodation. The number of people whose have their housing needs assessed is growing faster than the increase in emergency and social housing. Recent AUT research has estimated that some 150,000 people are affected by housing transience. Community Housing Aotearoa has said in its briefing to the Housing Minister Phil Twyford that community housing organisations are ready and willing to build many of the new houses that the new government wants to build. The main obstacle for them is access to capital funding, land as well as better procurement processes. Meanwhile work on better rental laws is also needed and part of the new government’s plans. Amendments to the Residential Tenancies Act introduced by the previous government are still being considered by the Parliament Select Committee. In NZCCSS’ submission on the bill we shared the concerns of the Drug Foundation, The Salvation Army and other submitters, that the proposed standards for meth testing that allow tenants to evicted with just 7 days’ notice are part of an unwarranted “meth moral panic”. The dangers posed by meth use in rental properties are lower than those from black mould and dampness, which remain the amendments so not cover. Loneliness and isolation is a crucial issue for older people, with recent research identifying that one in five of older New Zealanders that are referred to health services for assistance are lonely. Researchers Sally Keeling and Hamish Jamieson from Otago University used the data from needs assessments of 72,000 older people to identify that 15,000 of them were lonely. As the researchers say, interactions with others in the community are important to help people maintain their lives in the community, while loneliness can make health conditions worse, such as chronic pain, depression and respiratory conditions. This research supports the experience of social services working with older people in the community that identify isolation and loneliness as significant problem for older people in our increasing fragmented society. Social Workers Registration legislation Bill – NZCCSS submission to the Social Services and Community Select Committee supported aspects of the Bill. However, NZCCSS argued without the inclusion of a scope of social work practice to give meaning to the protected title of ‘social worker’ the Bill is fatally flawed and couldn’t be supported in its current form. NZCCSS also raised concern the NGO context was not sufficiently understood, specifically, risks associated with sustained underfunding of the NGO social service sector and the impact this risk has on the implementation of the Bill. Read NZCCSS’ written submission here. The State Sector and Crown Entities Bill The Bill is aimed at ensuring the CEO pay for crown entities follows State Services Commission guidelines. This is a small but welcome step to reign in the excesses occurring in some crown organisations, such as the million-dollar pay packet for NZ Super Fund Director Adrian Orr. Social investment – The word remains in use but the meaning we are assured has changed. Minister in charge of the Social Investment Agency, Hon Carmel Sepuloni, is yet to define the government’s vision for social investment, along with the remit of the Social Investment Agency. What we know is predictive risk modelling and individualised data collection are not favoured by the this government (and likely out) and in their place “rebuild the social safety net rather than just targeting those who might fall through”. Jonathan Boston and Derek Gill new book on Social Investment, which brings together academics, commentators and policy analysts from the public and private sectors to consider 1) How should social investment be defined 2)and conceptualized? 3) How should it be put into practice? 4) In what policy domains can it be most productively applied? As acknowledged by the Minister, who attended the launch, “the book couldn’t come at a better time”. Look out for NZCCSS Council Member, Diane Garrett, who is a contributor to this book. A recent Radio New Zealand interview on Waitangi Day with Aroha Tahere, a Oranga Tamariki, Site Manager at Kaikohe, caught our eye at NZCCSS. Aroha provides a whole-hearted insight into her work with local community trusts to support lower income families, and talks about how important it is to include iwi in their decision making and involvement of care for tamariki, and of whakapapa for a child’s well being and why that is so important in her region. It’s a beautiful interview complete with a Waiata in the background. Congratulations and a farewell. We end this e-letter with a congratulations to the Prime Minister Jacinda Ardern on the news of a future prime ministerial baby and to Julie Anne Genter on the news of a ministerial baby. Congratulations also to New Zealander of the Year Kristine Bartlett and to Kim Workman and Ricky Houghton and the other winners for their awards in recognition of all they have done to help the people of this country. We also end with a farewell to a long-serving and dedicated member of Parliament, Rt Hon Bill English, who recently announced his retirement from politics (1990-2018). This announcement signals significant change ahead for the National Party as candidates seek to fill his boots.